Brief Synopsis – The quest of Prince Albert, son of the king of England as he tried to overcome his stuttering in order to be a more eloquent royal public speaker. My Take on it – I actually enjoyed this movie even more during this re-viewing than I did the first time. Don’t get me wrong, I loved it the first time also, but was able to appreciate it even more so this time. The acting was superb. 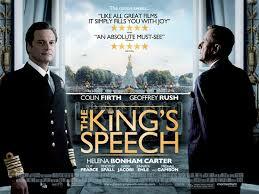 Colin Firth, Helena Bodham Carter and Geoffrey Rush were all excellent. I think that Rush was better than Christian Bale was in The Fighter (2010), but I guess the academy wanted to give someone else the Oscar besides Rush even though he was more deserving and should have gotten his second Oscar for this role. I think the length of this movie was perfect, it didn’t draw out like many biopics do and it also didn’t feel as if it was skipping around too much. Winner of 4 out of 12 Oscars in a very competitive Oscar year. It won Picture, Actor, Director and Screenplay. It lost Art Direction, Cinematography, Supporting Actor (Rush), Supporting Actress (Carter), Costumes, Film Editing, Music Score and Sound Mixing. Inception (2010) and The Social Network(2010) which were also great movies released that year won 4 out of 8 Oscars and 3 out of 8 Oscars respectively.